This delicious and extremely easy recipe is Coach-Net Kitchen Approved! You can prepare it the night before and then bake it the next day whenever you are ready – perfect for breakfast, lunch or dinner. If you have a favorite recipe you’d like to share, please email it to us. We’d love to hear from you! Coat a 9×13 inch baking pan with cooking spray. Place half of the waffle cubes in the pan; top with blueberries. Scatter cream cheese cubes over berries. Cover with remaining waffle cubes. Pour egg mixture over waffle mixture in pan. Bake, covered, for 30 minutes. Remove cover, and bake additional 30 minutes. 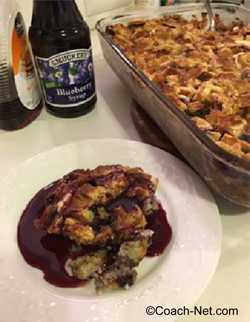 Serve warm with maple or blueberry syrup. Perfect for Christmas morning breakfast. Great for tailgate party’s and potlucks. Also great with precooked bacon crumbled, and sprinkled in waffle mixture prior to baking. Yum! Great question Bernadette! You can click on the small printer icon right below the ‘Tire & Wheel’ banner. This should allow you to print this recipe. Please let us know if you have any additional questions. Thank you! What happens if you don’t refrigerate overnight and cook it right away instead?